Miss Daisy fonts available in 2 weights, Smooth style in Bold and Light. And extra 2 styles of swashes available for giving us more flexibility to create creative design. 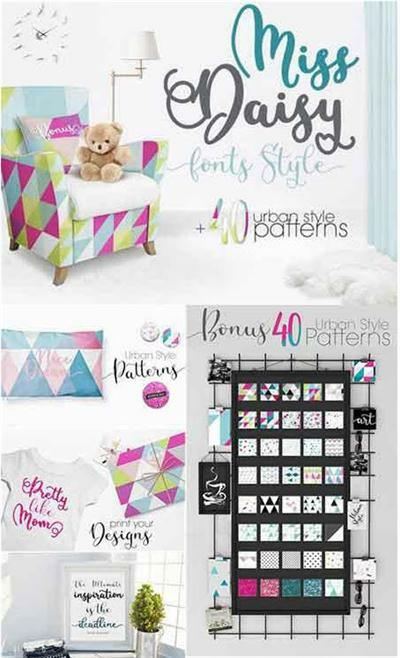 You will also get 40 Fresh and Colorful Urban Style Patterns! Available in JPG Seamless pattern, customizable AI Vector, web PNG transparent, and JPG digital paper 12x12 Inch format to make easy us printing them at home :). Miss Daisy fonts and patterns suitable for many fresh design project, Get some Inspiration and Let's design! If you are using Opentype Savvy Program such us Adobe Illustrator, InDesign etc, We can install only the main font (MissDaisy and MissDaisySlim) and access all extra glyph at 'Glyph panel'. If you are Photoshop or Office user, we can access all alternative letters by Install all .OTF font files.